Koh Phangan is a paradise island in the Gulf of Thailand in South East Thailand. Although it is most famous for its full moon party this beautiful island has so much more to offer. Blessed with some of Thailand’s most spectacular beaches and a still unspoiled interior, Koh Phangan is an ideal destination for those looking engage in wellness programs, such as a yoga or meditation retreat. Koh Phangan is a large island off the east coast of Surat Thani province in the Gulf of Thailand. 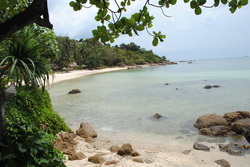 The island is located about 100 km off shore and about 15 km north of Koh Samui. Koh Phangan features some of the most spectacular beaches in Thailand, most of which are still only moderately developed, providing visitors with easy access to either a wild beach party or a relaxing and quiet beach holiday. While Koh Phangan was once the exclusive domain of backpackers who wished to escape the more commercially developed Koh Samui, there are now resorts that cater to all travelers, from honeymooners to families with children. That said, there are still many resorts that embody the hippie spirit of Koh Phangan’s “founders” and draw numerous budget backpackers looking to get away from it all, study meditation or yoga, or engage in other holistic activities. Located in the Gulf of Thailand a short boat ride from Koh Samui, Koh Phangan is a large, mountainous island covered with coconut trees and surrounded by white sand beaches and aquamarine waters. While each month thousands of young people flock to the world famous Full Moon Party in Haad Rin, where local and international DJs play music on the beach, there are dozens of other beaches in varying stages of development that are alternatively occupied by five-star beach resorts, and budget beach bungalows. Today, the coconut and fishing industries are still going, but they've been surpassed in monetary value by tourism and while the original inhabitants may have been predominantly Muslim, the present day population is mostly Buddhist. This is in part due to the massive influx of labour from elsewhere in Thailand seeking work in the thriving tourist industry. Over 10,000 people permanently live on the island, with the majority concentrated around Thong Sala.